In the past few weeks in the midst of an Ashes defeat down under, many of the worlds sporting press have also picked up on the heart warming story of Threlkeld Cricket Club. Threlkeld Cricket Club is a small village club in Cumbria which has a 1st X1, a midweek side, an U11 and an U13 side.Cricket has been played at Threlkeld for nearly 100 years and until 10 years ago the facilities consisted of a tin shed. After many years of hard work and tireless fundraising, enough money was raised to build a new club house which was runner up in Wisden’s prettiest ground competition. In June 2012 after a period of heavy rain a raised culvert filled with gravel and overflowed. Tonnes of gravel, rubble and toxic silt were deposited on large parts of the ground, especially the square. The water course drained old lead mine workings upstream and as a result the silt was laced with lead, arsenic and cadmium. Estimates from the England & Wales Cricket Board suggest this will cost upward of £50,000 to sort out. 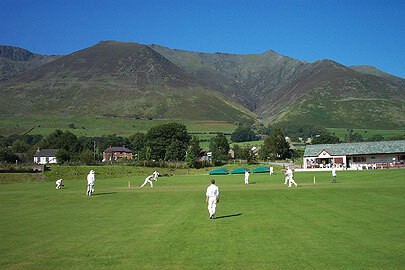 The club has very limited financial resources and without help Cricket may never be played at Threlkeld again. Threlkeld CC and the local community however have responded to the fundraising challenge with great enthusiasm and innovation. The team packed up their whites and went on a search for the most inspiring and extreme wickets the glorious Lake District has to offer. They looked VERY high and VERY low in order to find somewhere to play their unique brand of cricket whilst local photographer Stuart Holmes willingly volunteered to record the antics. This isn’t the first time that the Flicx Pitch has taken cricket to places where it has never been played before following games on Everest, The London Eye and Robben Island to name but three. From all the team at Flicx, we wish Threlkeld Cricket Club all the best with their fundraising… The calendar certainly makes a great sporting Christmas present!